Finding affordable and accessible dental care is a significant challenge for seniors. As you know, oral health is correlated with overall health in numerous ways. By helping seniors take care of their teeth, you’re helping to reduce their risk of gum disease, tooth decay, dry mouth, oral cancer, chronic illness such as diabetes, and other conditions. By facilitating access to dental care, you’re helping to improve the overall health and well-being of the seniors you serve. Integrating oral health into your organization’s regular practices by providing information about reduced fee, non-profit, and private practice dental services in your area. Exploring partnering with organizations such as senior centers, dental schools, and other aging services or dental care providers, to offer reduced fee services for dental exams and other critical dental services. Creating partnerships to offer these services – or helping to spread the word about the availability of services in your community – can make a huge difference in the health of seniors who might otherwise not be able to afford dental care. Reviewing the resources provided in this toolkit and considering how your organization can adapt and use them. The toolkit’s examples are from organizations who have forged partnerships and successfully increased access to reduced-fee dental care in their communities. Use these projects as inspiration for your own new ideas. 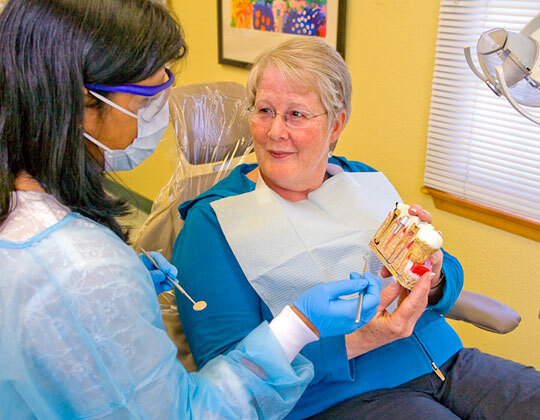 Explore the Project Examples and Resources in this section to help prepare to connect seniors to oral health services.